In general terms it’s an educated or best guess to a question. It’s what you think will happen. Dependent Variable: The variable that is being measured in an experiment. Independent Variable: The characteristic of an experiment that is changed. One way to structure your hypothesis is to describe what will happen to the dependent variable if you make changes to the independent variable. From this question a test could be setup to measure the actual effects of eating breakfast and making mistakes on forms. Research would be done and the outcomes calculated. The results would be posted and help us ascertain whether our hypothesis was true or not. For our purposes in personal development, we can easily ask questions, form a hypothesis, and conduct experiments. 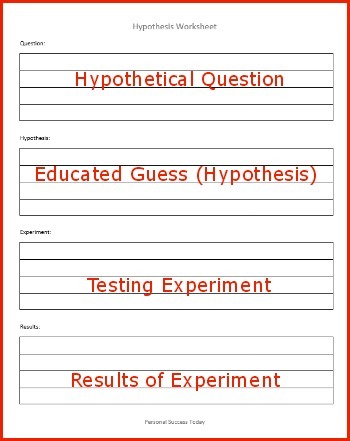 To help you do this, I’ve created a basic hypothesis worksheet, and two specific ones you can use for collecting ideas and testing the outcomes. These are great for planning new projects and testing ideas. For personal development, you’ll find this sheet is almost like a blank canvas, with four areas to ask your question, devise a hypothesis, create a testing experiment and record the results. While you could do this with a blank sheet of paper, this gives you a quick guide to help you find results quickly. In our next post we’ll look at some question/answer scenarios to setup your perfect Hypothesis and two specialized worksheets. You’ll see how asking the right questions and testing the answers can help you open the door to personal success. Question: What hypothetical questions would you ask? 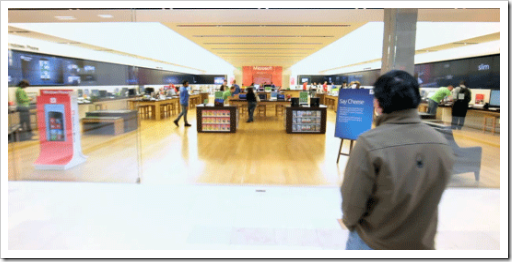 I had a chance to visit the new Microsoft Store in the Fashion Valley Mall (San Diego) last weekend. I wanted to upgrade one of my older PC’s from Vista to Win8 and thought I would visit the store and see the operating system in action. I had heard a lot of conflicting things about the operating system and wanted to go hands on with the new Microsoft Surface Tablets. It was almost a total rip-off of the Apple store. From the table setup, to the technology displays, and all the way down to the lanyards the employees wore around their necks, they were almost identical to the Apple guys. The main difference was a video wall that surrounded the store that was bright and changed often (A little distracting at times). Here again, nothing really original. 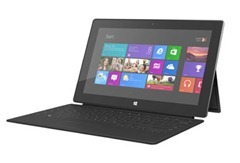 The Surface Tablet looks like an iPad with a Smart Cover (The actual tablet shape looks like a Kindle Fire). The difference is, the Microsoft cover is rigid and becomes a keyboard when opened. This seemed like an interesting idea, but it became a major problem very quickly. 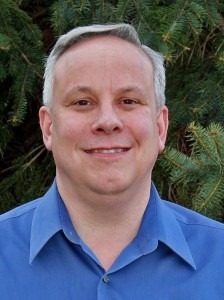 As we talked with a couple of the sales people, my wife and I were invited to take a Windows 8 introduction workshop. Since my wife would be using 8 on her PC, we decided to sit in on it. They took us back to a small presentation area in the back with a large screen and classroom style tables where they provided us each a Surface Tablet to follow along. This was actually pretty cool… until the class started. As we tried to follow along, neither of our keyboards on the tablets worked. The instructor swapped them out, but they still did not work. She said the units probably needed to be rebooted, but didn’t have time to do that. Without the keyboards working, the tablets were very difficult to use. After going through the class for over 30 minutes, I came to one conclusion. This interface was not consistent. You had to scroll one way to get to one menu, scroll another way to pull up the main icons. If you had a keyboard, you could use the Windows key to get back home. Without it, it was a mess. Had we not spent 30 minutes in the class we would have been totally lost. Even with the class, it would take a week or two to get used to where everything is. Compare this to the Apple iPad. One home button and a simple and familiar icon interface. I was up and running in five minutes. Once I was shown how you scroll with different fingers, I was home free. While the people in the store were very helpful and friendly, the product has a long way to go. Having two tablet keyboards not work, even after they were swapped out was a major fail. I would not buy a product like that. The Win 8 interface is even worse. With a long learning curve, users are going to be very frustrated quickly. I did upgrade my home PC when we got home, since Microsoft was offering a $39 upgrade price through the end of the month. The upgrade process went well and my old Vista machine was transformed into a much faster Windows 8 box. The interface looked just like the one in the store and we were up and running quickly. The big secret to making Windows 8 work, is to sign in with a Microsoft login. For most people, this will be a Hotmail or MSN e-mail address. Once you have done this, your e-mail is automatically setup, and you have your own interface unique to you. After a day or two of learning, tweaking, and playing around, my wife is pretty happy with the new machine. Taking the class at the store was very helpful. Bottom Line… the new interface is NOT Intuitive. 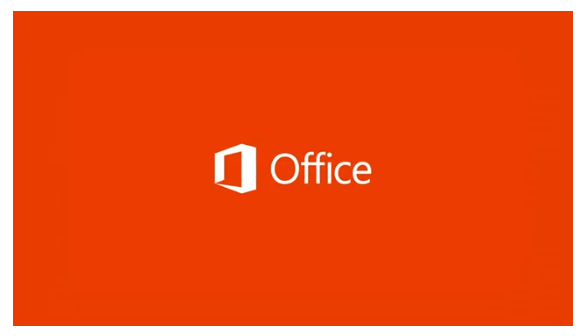 We downloaded the new preview version of Office 2013 and found that to have a consistent look and feel with the older versions. After working with Microsoft’s new Cloud interface, we were able to save documents and print things out with a minimum of fuss. 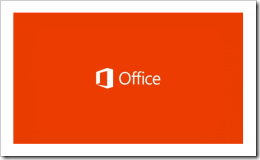 Office 2013 might be one reason to consider the Win 8 upgrade. Overall: If you have a PC with Windows 7, hold off for a while. There is no compelling reason to upgrade. If you have an older machine with XP or Vista and enough horsepower to run Win 8 (It runs a compatibility checker to let you know if you can upgrade or not) it might be a good upgrade. It made our Vista Machine much faster. You’ll definitely want to take a class to figure out how to navigate and install software. As far as the Surface Tablet goes, I was not impressed. The interface is clunky and the attached keyboard made things difficult if you are not sitting at a desk. The fact that the keyboards didn’t work on our demo units was very disconcerting. Here again, for the price, I think you would be much happier at the Apple Store. The only compelling reason to buy a Surface would be to run Microsoft Office natively. My Take: It looks like Microsoft is a year or two behind and decided to copy other companies instead of innovate themselves. The stores though, were bright and fun. Definitely check one out and take a workshop. Sooner or later you’ll need to know how to navigate Win 8 as it is the way of the future for Microsoft. Question: Have you tried Windows 8 or a Surface Tablet? What are your experiences? If you have been a professional writer for any time at all, you know how hard it is to find certain errors in your documents or manuscripts. You read them through and you know something is wrong, but you can’t put your finger on it. You sound out the sentences, rearrange them, and run them through the grammar and spell check in Microsoft Word. Yet nothing shows up. Frustrated you have another professional writer look at your document and take a stab at editing it. The document looks good, but there is something hidden that is driving you nuts. At the end of the day, you still can’t find it. Editing for hours, you can’t sleep, it’s so bad. You get up at the crack of dawn and take another stab at it. As luck would have it, you ask another friend and they tell you at the eleventh hour about Smart Edit, the free document checker. It’s about time. Maybe this will help. 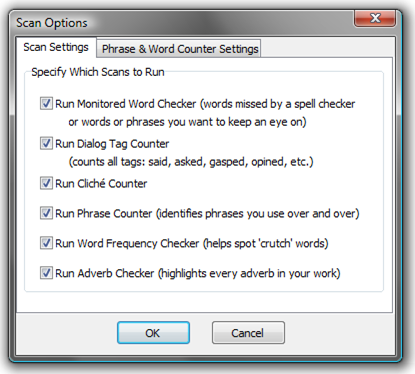 You download the free software on your PC and save your document in RTF format from your word processor. You are now ready to see if this editing program can find the problem. You are so tired of spinning your wheels that you hope against hope that this software can get you out of hot water. Your boss is breathing down your neck. Supposedly you are a professional writer. You’ve got to get this document out the door. 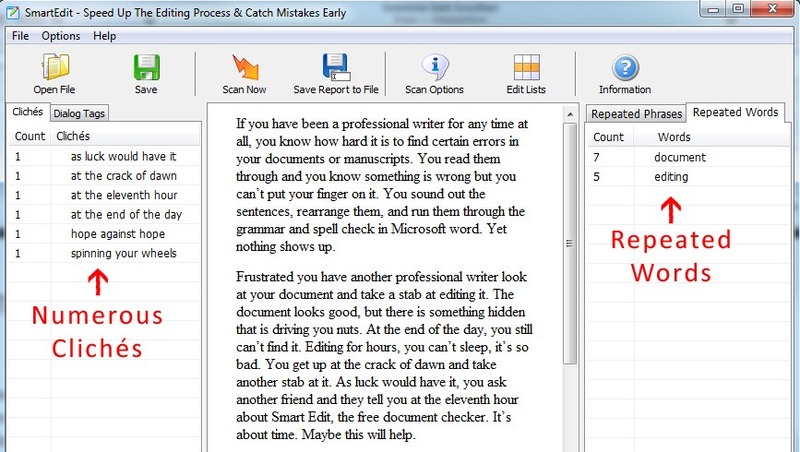 If you are a writer of any caliber, you should download this free program and run your documents through it. It’s quick and it can find numerous problems easily. 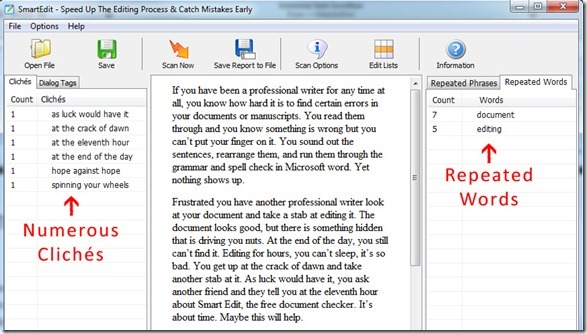 As you click on the individual errors the program highlights them throughout your document for easy correction. While this won’t replace a professional editor, it will help you find those troublesome errors that are hard to spot. 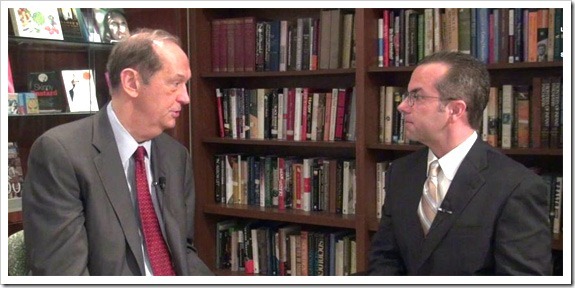 You can find out more and download the program for free at SmartEdit. Please note… this is a Windows program only. There is no Mac version. 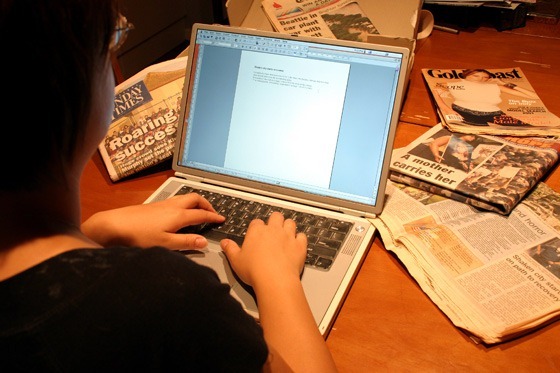 Overall: This is a quick and easy editor that should be in every writer’s toolbox! Question: Have you used Smart Edit before?